According to the General Staff of the Russian armed forces, new airborne command posts for military district commanders and fleets will be introduced this year. The command posts will be based on the modernized Il-476 airlifter, replacing the outdated Il-22. In addition, the Russian president receive two new Air Force One planes. In October 2012, the Russian Ministry of Defense and United Aircraft Corporation signed a 140-billion-ruble ($4.6 billion) contract to deliver 39 aircraft to the country’s armed forces. “The new aircraft must be integrated into the management information system of the entire Armed Forces, not only at the operational and tactical levels, but, for some command posts, at the strategic level as well. The system hasn’t been completed yet, but everything should be ready to integrate with it,” according to a statement made by the General Staff. The Il-476 is the result of a thorough modernization of the Soviet airlifter, which was developed in the 1970s. Preliminary engineering of the Il-476 began in the late 1980s and early 1990s, but its design was only completed in the spring of 2009. 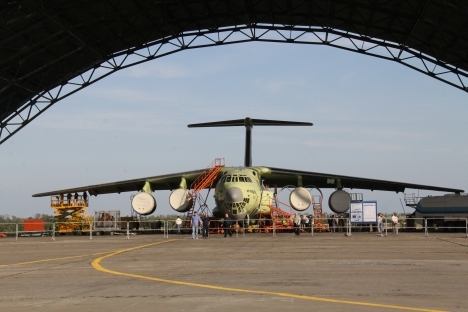 Throughout 2009, plans were made to sign contracts regarding the production of six Il-476 aircraft for India. In 2010, there were plans to build a prototype for endurance tests at the Central Aerohydrodynamics Institute. Batch production was scheduled to begin in 2011, but the plane only made its maiden flight last October. Scheduled tests will therefore be completed in 2013 or 2014. Compared to the original model, the Il-476 has a modified wing, new engines, modernized fuel and control systems, a digital navigation target acquisition system and an automatic flight control system. It also features a new “glass” cockpit with LCD controls. State-of-the-art electronic equipment was the military’s key requirement when placing the order for the new air command post, which must operate in the digital environment and provide stable and secure two-way communication. Also, the aircraft is expected to have a reliable electronic warfare and interception systems. Such systems are currently of particular importance, since electronic warfare equipment is widespread and available even to poorer countries. The military insists that the Il-22-based command posts are responsible for the failure of part of the air force to meet modern standards. On the other hand, the Il-476 cannot completely replace the Il-22, because of its limited flight-time and high fuel consumption. “Flying command posts are required by all commanders, and at least 20 are needed now — maybe even 40. If many of them are passed into service, flight time will be doubled and combined,” a source in the Russian military-industrial complex said. According to the Kremlin’s official website, the Russian president will receive two brand new Il-96-300PU (PU stands for “command post”) aircraft. The aircraft will have VIP interiors fitted with special communication equipment to allow for confidential conversations and management of the country’s nuclear forces. According to media reports, in addition to security and communication devices, the new presidential aircraft will also be equipped with special laser units to protect the presidential plane from man-portable and stationary air-defense systems. Under the contract with Ilyushin Design Bureau, the two planes cost 10.3 billion rubles ($342 million), while the standard Il-96 airliner costs between 1.2 billion and 1.5 billion rubles ($39.9 million–$49.9 million). The higher price is attributed to the electronic devices installed inside the hull. “This is a flying command post. It has many antennas, receivers, transmitters and sensors. We cannot put them on the body, for Air Force One would look intimidating. Therefore we have to put them all into the skin, the fins, the wings,” a source in the Ministry of Defense told Izvestia. Currently, the Russian head of state has four aircraft: the Il-96-300, Il-62, Tu-154 and Yak-40. All of these planes are equipped with modern security and communication systems, providing uninterrupted operation and comfort for flights of any duration.